Peace Breakthrough In Talks Between Colombian President And Rebel Leaders : The Two-Way Secretary of State John Kerry praised the progress in peace talks in Cuba between President Juan Manuel Santos and the leader of the Revolutionary Armed Forces of Colombia (FARC), known as Timochenko. 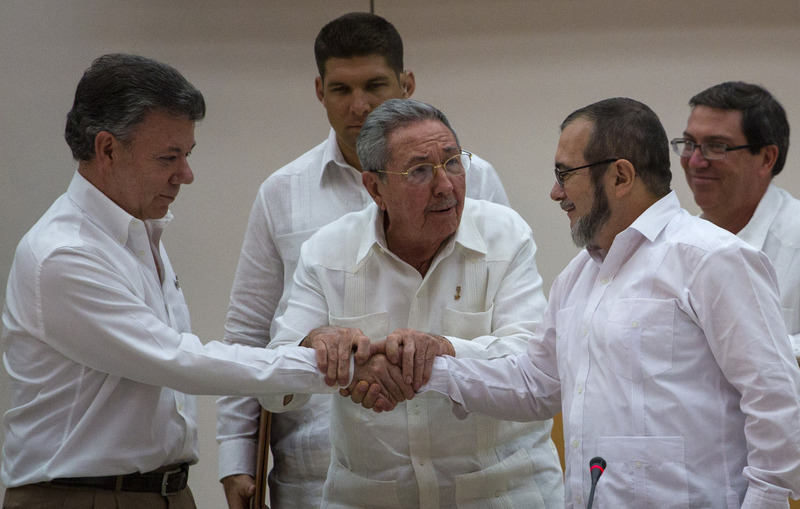 Cuba's President Raul Castro (center) encourages Colombian President Juan Manuel Santos (left) and the commander of the Revolutionary Armed Forces of Colombia or FARC, known as Timochenko, to shake hands, in Havana, Cuba, Wednesday. Today marked an apparent breakthrough in peace talks to resolve the longest-running armed conflict in Latin America. Colombian President Juan Manuel Santos and leftist leader of Revolutionary Armed Forces of Colombia (FARC) Rodrigo Londono, known as Timochenko, said Wednesday they have come to an agreement on a "formula to compensate victims and punish belligerents for human rights abuses," according to the Associated Press. "The Revolutionary Armed Forces of Colombia, known as the FARC, has been fighting the government for 51 years. The conflict has killed more than 200,000 people and displaced millions. "Under the agreement a truth commission will be formed, reparations for war victims will be set up and there will be amnesty for some fighters." In Havana, Cuba, where talks have been in progress for three years, Santos shook hands with Timochenko and said, "We are adversaries, but today we advance in the same direction, the most noble direction of any society, which is peace." Cuban President Raul Castro stood behind the men and clasped their hands together. As the AP notes, the announcement followed Pope Francis' visit to Cuba earlier this week, during which he "warned the two sides that they didn't have the right to fail in their best chance at peace in decades." However, a final deal would still need to pass Congress, and Santos has promised to give Colombians a chance to weigh in on a potential deal in a referendum. Still the progress was enough that both Santos and Timochenko announced the peace breakthrough on Twitter. Santos tweeted, in Spanish, "the peace is near." Tomochencko then tweeted a photo of himself in the airport, saying, "the peace has arrived." U.S. Secretary of State John Kerry praised the negotiators, saying, according to Reuters, "Peace is now ever closer. I have called President Santos to congratulate him and his negotiating team for their courage and commitment to the peace talks under extraordinarily difficult conditions." "While the agreement on Special Jurisdiction for Peace offers a form of accountability for abuses committed during the armed conflict, the fact is it would allow those most responsible for human rights atrocities to avoid spending a single day in prison. It is difficult to imagine how this arrangement could possibly survive a serious review by Colombia's Constitutional Court, or for that matter, the International Criminal Court."